Infrastructures are the fundamental basis for the sustainable development of a society’s economic prosperity and social well-being. The road infrastructure system in Costa Rica is especially vulnerable to extreme hydro-meteorological events. In the period from 2005 to 2017 such events caused economic losses of about US$ 2.210 million in the infrastructure sector of which more than half refers to road infrastructure (CNE 2017). In order to guarantee the functionality of the road infrastructure in the future and minimize costs for their preservation and reconstruction, climate proof infrastructure systems are essential. 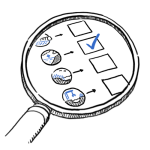 Climate risk management processes require the availability of adequate climate information which can be incorporated into development decisions and policy at relevant scale. In order to enhance the provision and use of climate information the current state of a National Climate Service for the context of the road infrastructure sector needs to be assessed and analysed. The baseline assessment is based on the concept and structure of the Global Framework of Climate Services. The study provides an overview of the Climate Service inventory which encompasses currently available Climate Service capacities and specific products. It furthermore reflects the current use and demands of Climate Services from the road infrastructure sector and lays out potential measures for enhancing Climate Services for the road and bridges infrastructure sector as a basis for efficient and effective adaptation planning. This orientation guide is focussing on terms and terminology related to Climate Services on the one side, and infrastructure climate risk management on the other. Hence, this glossary occupies a niche in climate risk research and practice. So far less attention has been on focussing on the Climate Service specialized terminology as well as infrastrucfurre specific issues related to climate risk. This guide has been built to develop a common understanding amongst partners of the Climate Services for Infrastructure Investment (CSI) project. 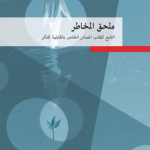 Arabic translation of the Risk Supplement to the Vulnerability Sourcebook is now available. 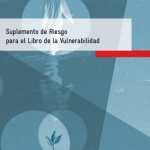 Spanish translation of the Risk Supplement to the Vulnerability Sourcebook is now available. 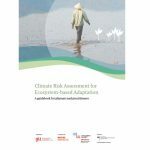 A guidebook developed by GIZ in collaboration with Eurac Research and United Nations University – Institute for Environment and Human Security (UNU-EHS) helps planners and practitioners in designing and implementing climate risk assessments in the context of Ecosystem-based Adaptation projects. 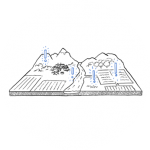 It provides a standardized approach to assess risks within social-ecological systems based on two application examples (river basin and coastal zone management) by following the methodology of the GIZ vulnerability sourcebook (GIZ 2014) and its Risk Supplement (GIZ and EURAC 2017). 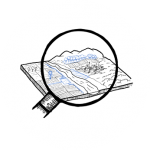 It helps to improve adaptation planning by considering both ecosystem-based and conventional options in the form of integrated ‘adaptation packages’. 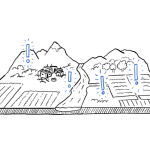 It includes the following modules: 1) Preparing the risk assessment 2) Developing impact chains 3) Identifying and selecting indicators for risk components 4-7) From data acquisition to risk assessment 8) Presenting and interpreting the outcomes of the risk assessment 9) Identifying adaptation options The guidebook can be applied at different stages of adaptation planning, from initial baseline assessments to repeated assessments in the implementation or M&E phase. The Risk Supplement to the Vulnerability Sourcebook introduces the IPCC AR5 risk concept and provides guidelines on how to conduct risk assessments using the Vulnerability Sourcebook’s approach. The Vulnerability Sourcebook provides step-by-step guidelines to conduct robust vulnerability assessments according to the IPCC concept of vulnerability. 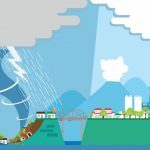 Since its publication in 2014, it has been widely used for vulnerability assessments in the framework of climate change adaptation planning from the local to the national level. The Fifth IPCC Assessment Report (AR5) moved from focusing on vulnerability to focusing on risk of climate-related impacts that may harm a system. To account for this change, in 2017 this Risk Supplement has been developed. As part of applying the Vulnerability Assessment for Socio-Ecological Systems (VASES) approach in Ha Tinh province, vulnerability assessments for ecosystem-based adaptation were conducted at both macro and micro levels, and based on their findings, ecosystem-based adaptation measures could be identified as stand-alone responses or complementary sets of possibilities for hardware-based/infrastructure-based measures to climate change adaptation. As part of applying the Vulnerability Assessment for Socio-Ecological Systems (VASES) approach in Quang Binh province, vulnerability assessments for ecosystem-based adaptation were conducted at both macro and micro levels, and based on their findings, ecosystem-based adaptation measures could be identified as stand-alone responses or complementary sets of possibilities for hardware-based/infrastructure-based measures to climate change adaptation. IPCC 2007: Climate Change 2007: Impacts, Adaptation and Vulnerability.